Natural beneficial bacteria, like those found in The Pond Guy® Liquid Clear™, will keep your tank water clean (and give your mechanical filtration system a break! ), so pour some into the tank. The tiny microbes activate as soon as they hit the water, multiplying every 20 to 40 minutes and digesting dead organics in the water. The result: crystal clear water and happy fish. A stress reducer, like The Pond Guy® Stress Reducer Plus, will help your fish enjoy their indoor stay, too. The water conditioner fortifies your fish’s slime coat, which is the natural slime secretion that’s lost when its stressed. It also removes heavy metals, chlorine and chloramines from tap water, making it safe for underwater living. Q: Are other fish like my plecostomus as hardy over the winter as my koi? A: We talk about how koi and certain types of goldfish, like Sarassa and Shubunkins, can overwinter in your pond or water garden even when water temperatures dip to near-freezing levels. But what about other common pond fishes? Well, it depends on your USDA hardiness zone, which divides the country into zones based on how cold the temperatures get. Just as with plants, some fish species can be “hardy” in some climates and not in others. An Oranda, for instance, might do just fine overwintering in a pond in Orlando, Fla., but up in Fargo, N.D., that same fish would turn into a popsicle—even with an aeration system and de-icer. 1. Keep a close eye on your pond’s water temperature using a thermometer, like the Floating Pond Thermometer. When the mercury hits 68 degrees or so, it’s time to bring those less hardy fishes—including Plecostomus, Oranda, Telescope goldfish and Black Moors—inside. 2. Carefully scoop those snowbird fishes out of the pond with a net, like The Pond Guy® Collapsible Fish Net, and place them in a bucket pre-filled with some of your pond’s water. 3. Re-home the fishes in a properly sized indoor fish tank or aquarium outfitted with the right mechanical and biological filtration system for the job. Be sure to condition the water and pre-treat it with some beneficial bacteria to kick start the system’s biological filtration, too. As soon as sun thaws your pond water—or at least heats it back up to room temperature—it’s safe to return those fishes to their “summer” home. Pond Talk: What kind of overwintering setup do you have for your less hardy fishes? 1. Keep a close eye on your pond’s water temperature using a thermometer, like the Pond Logic® Floating Pond Thermometer. When the mercury hits 68 degrees or so, it’s time to bring those less hardy fishes—including Plecostomus, Oranda, Telescope goldfish and Black Moors—inside. Q: There are so many de-icers to choose from. What size do I need? A: A de-icer is an important piece of equipment in areas where water features freeze over during the winter. This little device maintains a small opening in the ice, which allows harmful gas to escape into the air allowing for efficient air exchange. 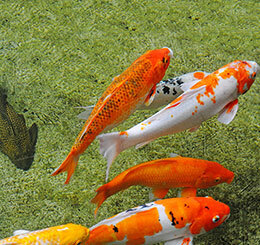 It can be the difference between life and death for the fish and other inhabitants in your pond. Which de-icer is best for your situation? It will depend on how many gallons your pond holds, and if you’re using it alone or with an aeration system. K&H™ Perfect Climate™ Pond De-Icer comes in 250-, 750- and 1,500 watt options. The thermostatically controlled de-icer is designed for floating or submersible use. Farm Innovator’s Floating Pond De-Icer, pumps out 1,250 watts of ice-melting power. It’s also thermostatically controlled and turns on when water temperature drops below 35°F. These de-icers do a great job, but keep in mind that they can be expensive to run non-stop during the cold months. A 1,500 watt de-icer can cost up to $75.00 to operate. That’s a big bill for a small hole! That’s where an aeration system comes into play. Aeration systems – can help maintain a hole in the ice while adding oxygen and are infinitely more energy-efficient than pond de-icers. When used in tandem, aeration can significantly reduce the wattage requirements of your pond de-icer, allowing the use of a smaller 100 watt de-icer. It’ll cut energy costs and save you money all season long. For example a 2,000 gallon pond using the PondAir™ 4 and 100 Watt Thermo-Pond De-Icer will cost $5.40 per month instead of $75.00 using a de-icer alone. Not a bad deal! If you decide to go this route – and why wouldn’t you? – Select the Airmax® PondAir™ and Thermo-Pond 3.0 De-Icer Combo. The combo comes with either the Airmax® PondAir™ 2 (for ponds 1,000 gallons or less) or the Airmax® PondAir™ 4 (for ponds 2,000 gallons or less). Both the PondAir™ 2 and PondAir™ 4 includes: air stones, check valves, black vinyl air tubing and the 100 Watt Thermo-Pond De-Icer. For an additional charge, you can also throw in a Mini Boulder TrueRock™ Cover to protect the air compressor. De-icers are important, but they don’t have to break the bank. Invest in an aerator-de-icer combo and save your money for something you really want – like some new koi! Pond Talk:What parts of your winter landscape do you most look forward to?